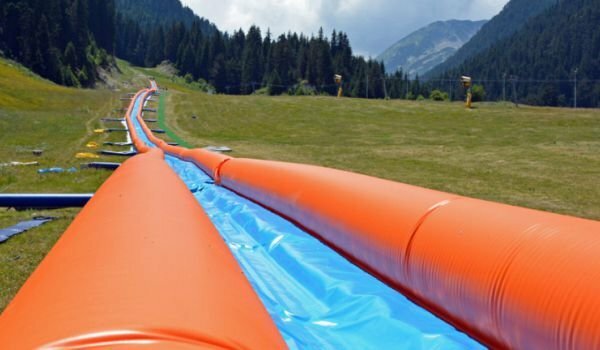 The inflatable water slide in Bansko, the longest in Europe, is now open to visitors. The latest attraction is located at Banderishka Polyana, writes Trud newspaper. The slide is 1148 ft (350 m) long, with similar ones found only in the US, New Zealand and Australia. The price for sliding down it once is 12 leva for adults, 9 leva for children, with bundle packages also available. There are also plans for additional recreational activities to be added to the Banderishka Polyana area - foosball, shooting range, soccer and mini golf. Tourists can also currently enjoy mountain biking trails with varying degrees of difficulty. Bicycles are available for rent on location.